Michael Woods says Hartlepool United are desperate to give fans “something to cheer about” this season. 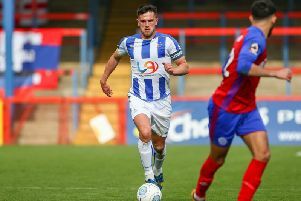 The midfielder admitted he had to pinch himself when he saw a lot of Pools fans on Saturday at Livingston where the third pre-season match of the summer ended goalless. Credit to them, you could hear them too – I think there were as many Poolies here as home suppporters. Last season, Pools fans have travelled in their numbers and they made up a third of the crowd at the Almondvale Stadium, though now catchily known as the Tony Macaroni Arena. “I couldn’t believe it when I saw them the all when I got off the bus,” smiled the 25-year-old. “I had to look twice to see they were Hartlepool shirts, I thought they were Rangers fans coming to watch! “Credit to them, you could hear them too – I think there were as many Poolies here as home suppporters. Woods was responsible for missing one of the side’s best openings, hitting a left-foot shot over the bar after coming on in the second half. Billy Paynter, Lewis Hawkins and Nicky Deverdics went close in the first 45 minutes, while after the break, Jordan Richards missed a glorious chance and hope keeper Liam Kelly saved superbly from Kieran Green’s long-range shot. Woods though said Pools could be satisfied with their afternoon’s graft, pointing out that bar a couple of early saves, keeper Adam Bartlett was not unduly stretched. “We did look leggy to begin, but we’d had an early start and a long journey,” he said. “But once we grew into the game, we controlled it. “We’ve done some good work in training, now it’s about getting the minutes into the boys’ legs. We created more, Barts came off after the second half and didn’t remember having to make a save, which bodes well. “We need to work on things at the other end, we got into some good positions, created opportunities without having that clinical edge in the box, but it will come. “The boys are getting fitter and sharper by the day.